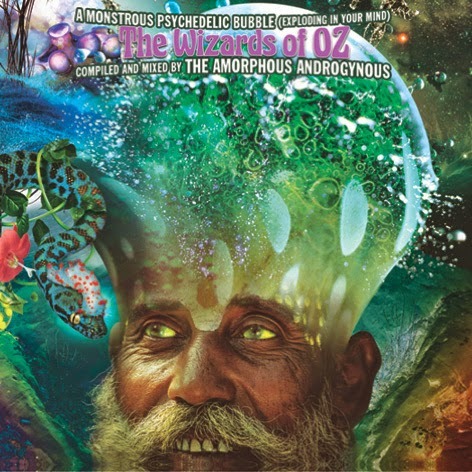 After two years of extensive crate-digging and foraging the Amorphous Androgynous return with the latest installment in their award winning series ‘A Monstrous Psychedelic Bubble (Exploding In Your Mind) – The Wizards Of Oz’, released through Monstrous Bubble Recordings and Australia’s iconic Festival Records on 16th March 2015. ‘The Wizards Of Oz’ is devoted exclusively to the rich heritage of cosmic space music of our Antipodean brothers and sisters and in common with previous volumes traces the lineage from the sixties to the present day with sonic delights from every decade in between. Across the double CD there is a 2 hour DJ mix of 34 tracks where we are treated to everything from Kiwi Krautrock to Aboriginal space jazz to OZ dream pop to cOZmic funkrok: CYBOTRON / TAME IMPALA / KANGURU / RUSSELL MORRIS / GEOFF KROZIER & THE GENERATOR / HIROSHI & CLAUDIA / MADDER LAKE / ROB THOMSETT / MANDU / DOUG JEREBINE / POND / SONS OF THE VEGETAL MOTHER / RAILROAD GIN & AIR are just a few of the delights contained therein.